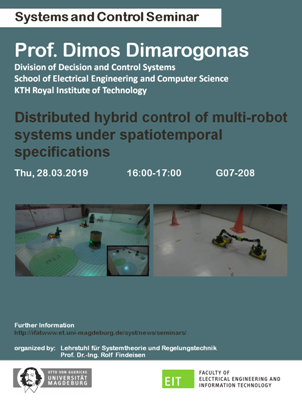 The seminar talk takes place on March 28, 2019 at 4-5 p.m. in building 10, room 460 at Universitaetsplatz 2. Multi-robot task planning and control under temporal logic specifications has been gaining increasing attention in recent years due to its applicability among others in autonomous systems, manufacturing systems, service robotics and intelligent transportation. Initial approaches considered qualitative logics, such as Linear Temporal Logic, whose automata representation facilitates the direct use of model checking tools for correct-by-design control synthesis. In many real world applications however, there is a need to quantify spatial and temporal constraints, e.g., in order to include deadlines and separation assurance bounds. This led to the use of quantitative logics, such as Metric Interval and Signal Temporal Logic, to impose such spatiotemporal constraints. However, the lack of automata representations for such specifications hinders the direct use of model checking tools. Motivated by this, the use of transient control methodologies that fulfil the aforementioned qualitative constraints becomes evident. In this talk, we review some of our recent results in applying transient control techniques, and in particular Model Predictive Control, Barrier Certificates based design and Prescribed Performance Control, to distributed multi-robot task planning under spatiotemporal specifications. We consider the case of infeasible specifications and propose a least violating control strategy as a remedy. The results are supported by relevant experimental validations. Dimos V. Dimarogonas was born in Athens, Greece, in 1978. He received the Diploma in Electrical and Computer Engineering in 2001 and the Ph.D. in Mechanical Engineering in 2007, both from National Technical University of Athens (NTUA), Greece. Between 2007 and 2010, he held postdoctoral positions at the KTH Royal Institute of Technology, Dept of Automatic Control and MIT, Laboratory for Information and Decision Systems (LIDS). He is currently Professor at the Division of Decision and Control Systems, School of Electrical Engineering and Computer Science, at KTH. His current research interests include multi-agent systems, hybrid systems and control, robot navigation and manipulation, human-robot-interaction and networked control. He serves in the Editorial Board of Automatica and Unmanned Systems and is a Senior Member of IEEE. He is a recipient of the ERC Starting Grant from the European Commission in 2014 for the proposal BUCOPHSYS and the Knut och Alice Wallenberg Academy Fellowship in 2015 for the proposal MULTISPEC.